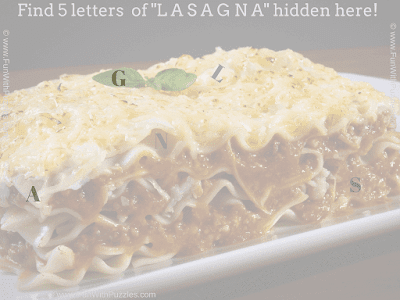 This Picture Riddle is for Lasagna lovers. Here is the picture of Lasagna cooked in Sara's Cooking Class. However this Picture contains 5 hidden letters of word "LASAGNA". It means letters L, A, S, G and N are hidden in this picture. You your great observational skills to find these hidden letters in this picture. Let's see how quickly can you find these hidden letters? Can you find 5 hidden letters L, A, S, G and N in this picture? Answer of this "Hidden Letters Lasagna Picture Riddle", can be viewed by clicking on button. Please do give your best try before looking at the answer.